- Prestige Collectibles has a new auction going on. It will be running until October 21. As usual, there's a lot of rare and cool stuff for auction. 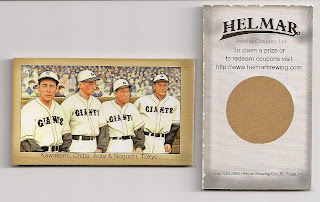 - I completely forgot that Deanna had a post up last week about opening some packs of Calbee Series 3. BBM started their 2004 year with the now annual "Historic Edition" set - this year featuring pitchers in a set called "Golden Arm". It contained 144 cards split between 72 cards of active players and 72 cards of OB players. 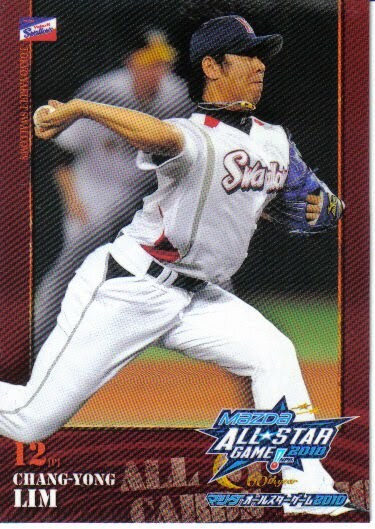 There were two 12 card insert sets - "Super Arm" featuring active pitchers and "Great Arm" featuring OB pitchers. 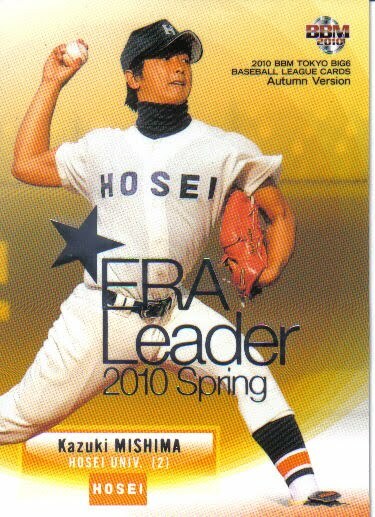 There were also autograph and undershirt memorabilia cards available. The Rookie Edition set returned for a second year. The set was shortened to 121 cards with only 71 cards for picks from the fall 2003 draft (the remaining cards were again active players shown in their rookie seasons and "Rookie Year Reports" for one 2003 rookie per team plus two checklist cards). 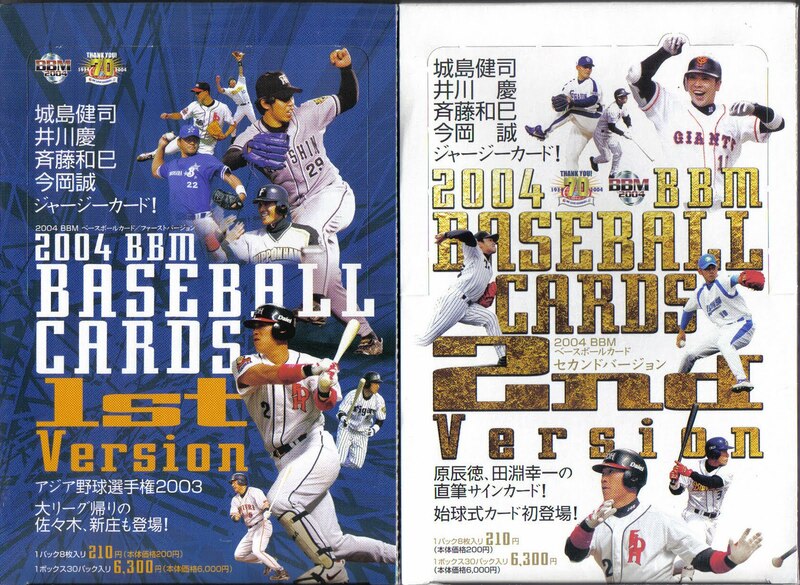 There was again a facsimile autograph parallel issue, a 21 card insert set featuring former Rookies Of The Year and two possible ball memorabilia cards featuring the 2003 Rookies Of The Year (Hiroshi Kisanuki and Tsuyoshi Wada). 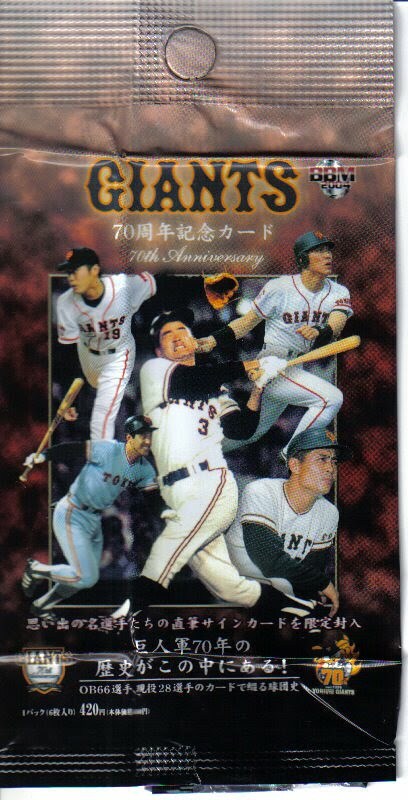 To celebrate the 70th Anniversary of professional baseball in Japan, BBM issued a 48 card box set. I've gone on at length about this set in the past, so I won't say much more about it here other than it's pretty much a rehash of the 2002 All Time Heroes set and it celebrates 70 years of baseball by leaving out the most significant player. Once again, the "regular" set was issued as 1st and 2nd Version sets which were roughly the same size. 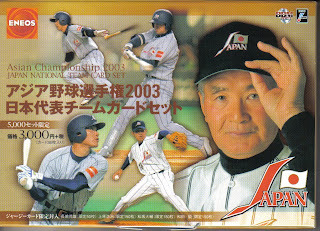 The 1st Version set was 440 cards with insert sets for Best 9 and Golden Glove as well as one for players from the 2003 Asian Championship team. The 2nd Version set contained 412 cards plus insert sets for the pitchers and cleanup hitters in the Opening Day lineups for each team, Newcomers and Team Captains. Both sets again featured the facsimile autograph parallel issues and various jersey memorabilia cards. 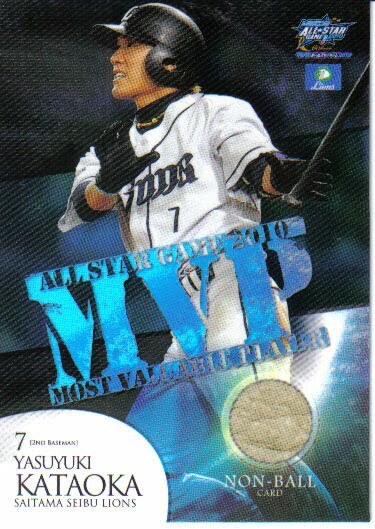 Once again, BBM issued boxes of "Light Packs" for the sets which featured the "Kira" parallel issue and MVP inserts. 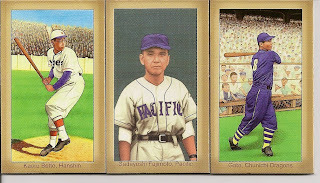 The "Touch The Game" set was issued with 146 cards along with a serial numbered parallel issue. As always, there were a boatload of memorabilia cards available, including parts of baseballs, Hisashi Iwakuma's windbreaker, Koji Uehara's undershirt, Nobuhiko Matsunaka's jersey, Kazuyoshi Tatsunami's bat, Munenori Kawasaki's spikes and Norihiro Akahoshi's stockings. The annual All Star game set was a 65 card box set. 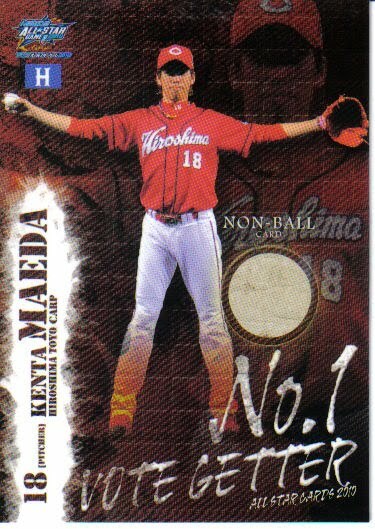 It featured possible serially number parallel versions for the players who were selected by the fans as well as the "Number 1 Vote Getter" (which means that the number one vote getter - Kenji Johjima - had two different serially number parallel cards in the set). For the first time, BBM issued pack based team sets for all 12 teams. The sets were either 96 or 99 cards in size and featured the usual array of facsimile autograph or "kira" parallel issues, insert sets and memorabilia cards. 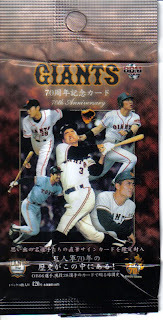 In addition, BBM also issued a 15 card Giants team set that was given away to subscribers of the Daily Yomiuri newspaper. 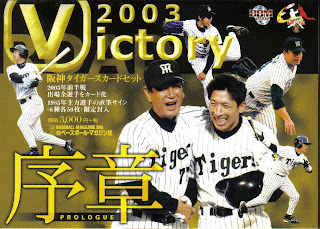 The big news of the 2004 season was that Kintetsu was selling the Buffaloes to Orix who would merge the two teams together after the season. 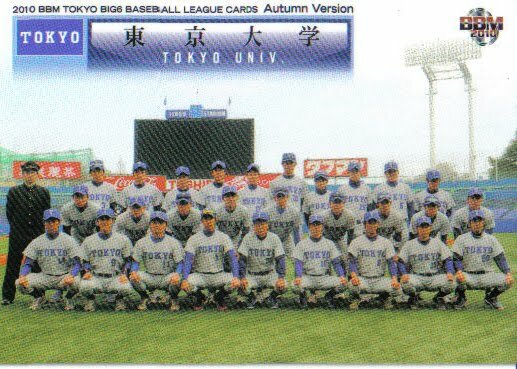 BBM produced a 56 card Kintetsu Memorial box set that included possible autograph, jersey, windbreaker, bat, batting glove and spikes cards. As usual, the Central League Champion (the Dragons) was commemorated with a box set. The Dragons set contained 44 cards including possible "pitching rubber" or "home plate" memorabila cards. The Pacific League introduced a playoff system in 2004 which resulted in BBM issuing a box set containing cards for all three teams (the Fighters, the Hawks and the Lions) in the playoffs. The set contained 57 cards - 16 cards for each team's players and manager plus three "season highlight" cards for each team. Surprisingly, there were no insert or memorabilia cards associated with the set. 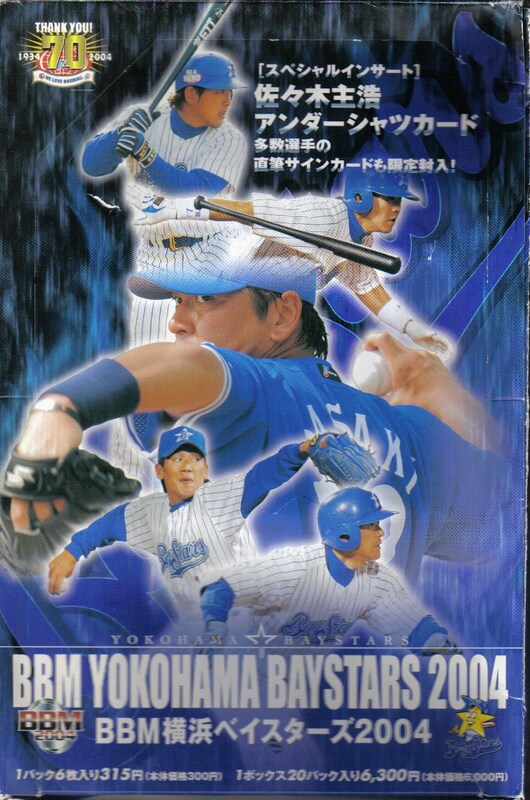 As usual, BBM issued a box set in honor of the Nippon Series (the Lions defeated the Dragons). 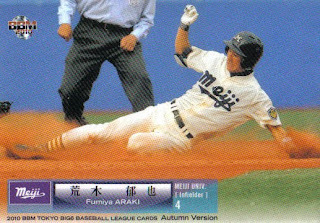 The set contained 63 cards with possible parallel versions of the Series MVP card (Takashi Ishii). A box set commemorating Senichi Hoshino, who had retired as Tigers manager abruptly the previous off season due to health issues, was released. The 45 card set included possible facsimile autograph, photo, film or ball cards. The final set for 2004 was a high end "Carp Expert" box set. 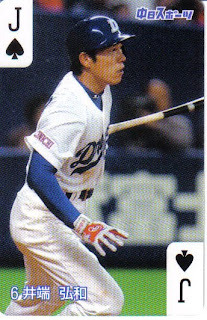 The set contained 35 cards - five cards each of seven different players - Hiroki Kuroda, Shinji Sasaoka, Kenjiro Nomura, Shigenobu Shima, Takuya Kimura, Tomonori Maeda, and Koichi Ogata. Each set contained a possible memorabilia or autograph card. From top to bottom, that's the 1st and 2nd Version boxes, the Baystars team set box, a Giants 70th Anniversary wrapper and the Pacific League Playoff set box. On Thursday, Ichiro Suzuki of the Seattle Mariners reached 200 hits for the 10th straight season. 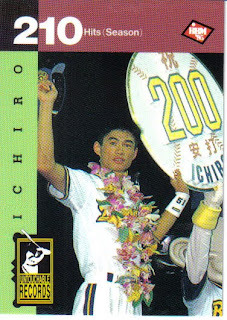 Ichiro was, of course, the first player in Japan to ever get 200 hits in a season when he did it back in 1994. (He currently holds the record for most hits in a season in both the NPB - 210 hits in 1994 - and MLB - 262 in 2004). His 10 200 hit seasons ties him with Pete Rose for the most 200 hit seasons in Major League history. 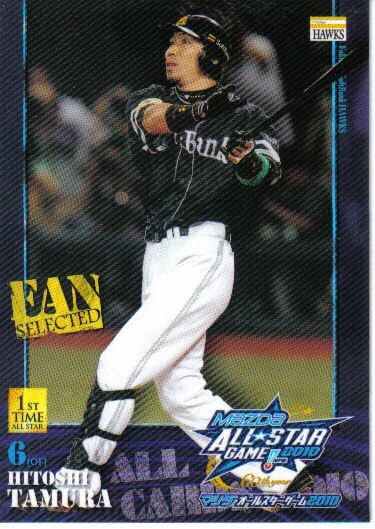 Since Ichiro first crossed the 200 hit mark, only Norichika Aoki (in 2005) and Alex Ramirex (in 2007) had followed. Until this year. Three players this season have reached 200 hits, Norichika Aoki (again), Matt Murton and Tsuyoshi Nishioka. In fact, Murton and Aoki have shots at beating Ichiro's record - Murton has 203 hits with 9 games to play and Aoki has 200 hits with 8 games left (numbers from Yakyu Baka). In the meantime, however, Ichiro remains the record holder, celebrated here in a card from the "Untouchable Records" subset in the 1995 BBM set (#325). 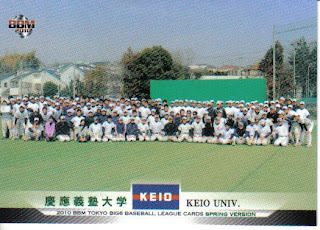 The cards, and the back of one card, are shown. The design and artwork on the cards is attractive, but not very accurate. 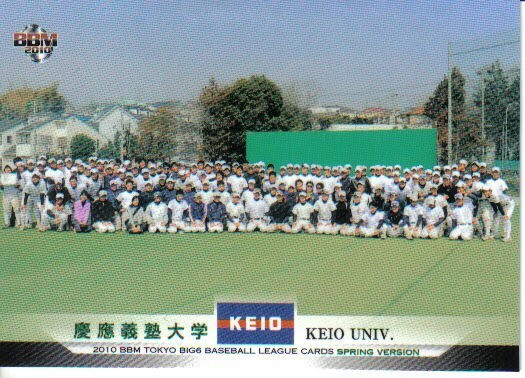 I referred to “The History of Uniform”, 2005, for uniform illustrations, and to the online Japan Baseball Daily Data Warehouse for teams, years, and positions. 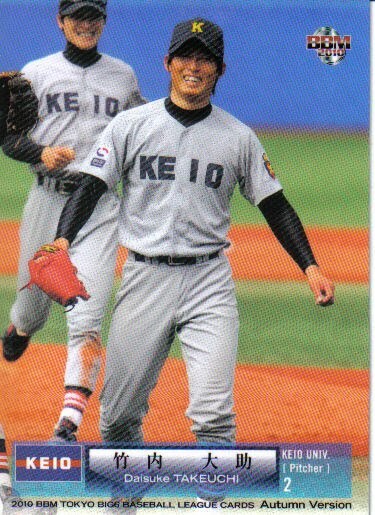 The uniform worn by Betto, who was a Hall of Fame slugging outfielder for the Osaka Tigers during 1948-49, shows a red “O” on the cap (used only in 1936-40 and 1953-57) that should be black or blue; the leggings are missing the two yellow bands; and the red piping on the sleeves never existed. Fujimoto was the manager of the Pacific team (which became the Robins, then the Whales, and now the BayStars) in the Japanese Baseball League in 1946. His Hall of Fame managing career included nine league championships. His cap is missing the “P”. 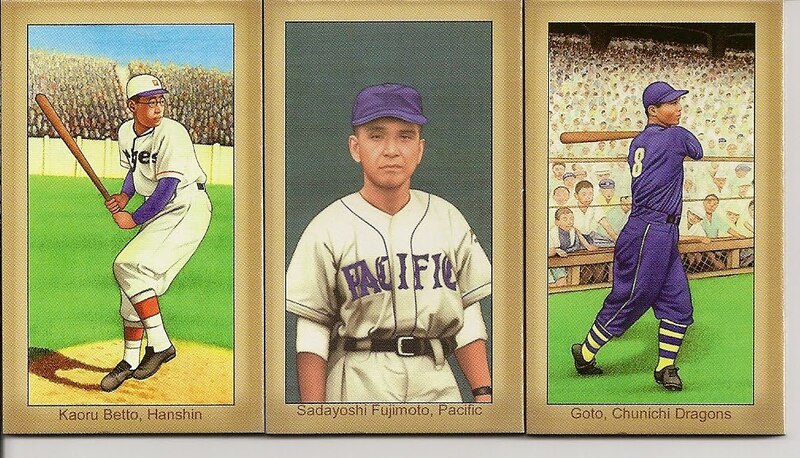 The Goto card (which must be Tsuguo, though his first name is not given), says Chunichi Dragons but shows him in the unique alternate Osaka Tigers uniform of 1948-49. He wore, as shown, uniform #8 as center fielder for the Tigers from 1948 to 1957, and never played for the Dragons. Tokuji Iida was a star first baseman for the Nankai Hawks during 1947-1956. 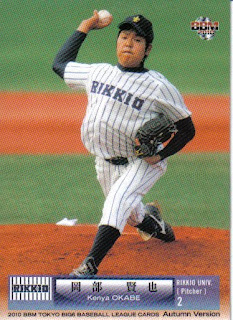 His name is misspelled on the card as “Lida”. He is shown in a pinstripe uniform, but the 1948-1949 Hawks uniform actually had pairs of pinstripes, a dark blue cap, and red- and blue-striped socks. 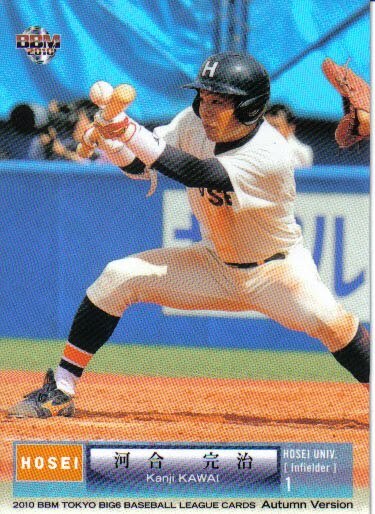 Tetsuharu Kawakami was a superstar first baseman for the Yomiuri Giants during 1938-1942 and 1946-1958. His uniform on the Helmar card appears to be the only one that is correct for the period when he played. 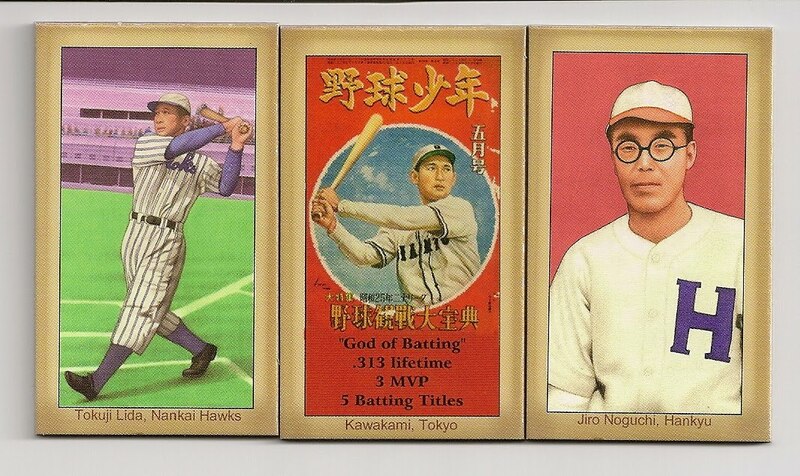 Jiro Noguchi was a star pitcher for the Hankyu Braves, of the Japanese Baseball League and then the Pacific League, during 1946-53. The uniform is right, but the red brim on the cap should be dark blue. 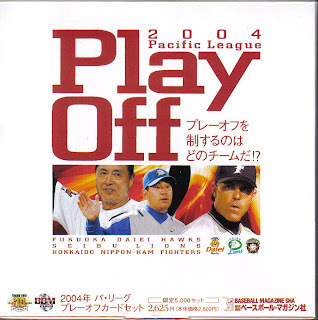 The four-player card shows them in Yomiuri Giants uniforms that are close, but not correct for any years. The caps are right for 1947-1950, but the orange stripes were on the 1950 shirts that had “GIANTS” in orange, not black. 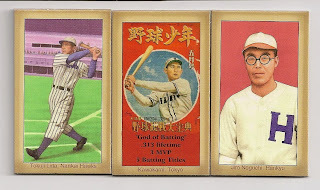 Including Japan baseball stars in the Helmar Famous Athletes Series was a nice touch, and justified by the quality of these players, but a little more research by the card artists was needed. I am not tempted to acquire the other card series issued by Helmar: Series 2 (2007), or Series 3 (2008). Thanks for the information, Bill. I've seen some of the later cards on eBay - instead of being patterned on the 1910 T206 tobacco set, some of them are based on the 1933 Goudey design. There are some nice looking cards out there, but they might also have the accuracy issues that Bill has pointed out here. I had never thought about having a guest blogger before, but it's not a bad idea at all. If anyone else wants to write an essay on a relevant topic, let me know. Haven't seen this on BBM's website yet, but AmiAmi's had a listing for a couple weeks for a new box set for the annual Premium Malts old timers game. It's a 54 card set with 53 cards for the players and coaches and one insert card of some type. The rosters for this years game include a lot of the same players from last year (including Isao Harimoto, Koji Yamamoto, Osamu Higashio, Randy Bass, and Shinji Sasaoka) plus some new ones like Yutaka Enatsu, Choji Murata, Suguru Egawa, Norihiro Komada and Shigeki Sano. AmiAmi's got the set priced at 3383 Yen (roughly $40) which I personally think is a little steep for it. Supposedly it'll be out in late September. Update: BBM still doesn't have anything up on the set, but Discount Niki does. The insert cards are apparently possibly either jersey or autographed cards. Looks like they have the release day as September 30. Deanna recently had a picture up on her website of herself with the Keio University manager, Shozo Etoh (it's a long post and the picture is near the end). According to Deanna, Etoh is the only current Tokyo Big 6 manager who played in the NPB, having played for the Giants in the late 60's (during the V9 years) and the Dragons in the 70's. 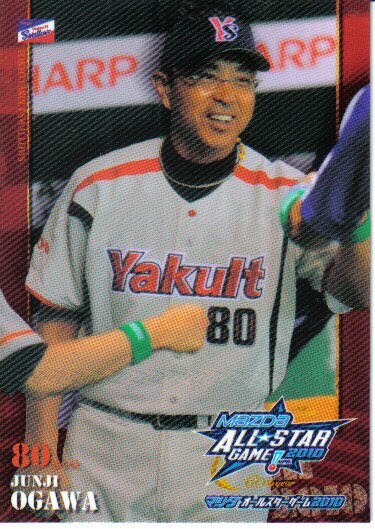 He's also the younger brother of the late Hall Of Famer Shinichi Etoh - in fact, they were teammates on the 1969 Dragons. I love AmiAmi. I paid for this set last Friday and the post office attempted to deliver it on Monday. I wasn't able to drop by the post office and pick it up until today. So five days from paying for it to in my hands. Not bad at all. Anyway, on the the set. The 2010 BBM Tokyo Big 6 Autumn Version set is a 37 card box set containing 30 "regular" cards for players from the six universities (five per team), 6 team cards and one insert card. 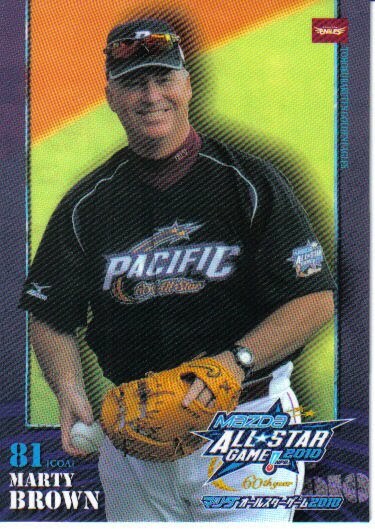 That may be one of the most unflattering pictures I've ever seen on a baseball card. It looks like he's got a pillow under his jersey. Nine of the ten players in the insert set appear in the regular set - the only one who doesn't is Takayuki Matsuo of Keio (who hasn't been in a Big 6 set since the first Spring one in 2008). UPDATE - Deanna's got a post up about the set now too. It is really cool that she's got the Kawai picture from the opposite side. I'm trying to figure out who took the BBM picture - probably the guy on the left. BBM's first set for 2003 was the Sluggers set - the "Historic Edition" set for the year. It established the pattern that would be followed by future "Historic Edition" sets - a 144 card base set broken down into 72 cards for OB players and 72 cards for current players. The set also featured a small, 12 card sepia parallel issue, a couple insert sets (12 card "Super Slugger", 3 card "Great Slugger" and 5 card "Slugger Bonus") and a couple bat and signature cards. 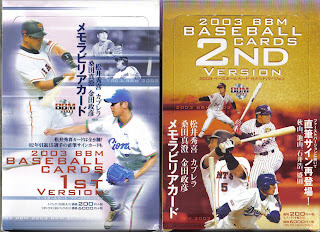 The big change for 2003 was the replacement of the Preview set with the Rookie Edition set. BBM apparently decided to expand the small, draft pick section of the previous Preview sets into a full blown draft picks set. This set contained 152 cards - 90 cards featuring players chosen in the previous fall's draft; 60 cards featuring active players (showing pictures from their rookie season) and 2 checklist cards. 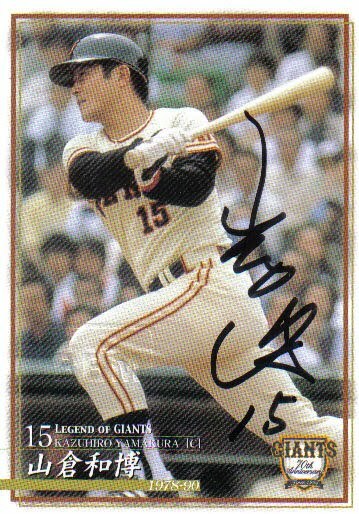 The set also featured a 36 card facsimile signed parallel set. Once again, BBM issued 1st and 2nd Version sets in lieu of a single regular set. The 1st Version set featured 432 cards along with the Best 9, Golden Glove and Sluggers insert sets. The 2nd Version set had 407 cards along with Opening Game and Record Achievement insert sets. Both sets also featured facsimile autographed parallels and windbreaker memorabilia cards. In addition to the regular boxes of packs, BBM also issued boxes of "Light Packs" - six cards to a pack. These packs featured a Kira parallel issue and MVP insert sets. Speaking of pack size - up to and including the 2003 1st Version set, BBM had always issued cards for the regular sets in packs of 10 cards. For the 2nd Version set this year, however, BBM would reduce the number of cards in a pack to 9. It would further reduce the number to 8 in 2004 where it has remained to the present. "Touch The Game" returned for a second season with a 144 card set. It also featured two parallel issues, an All Star insert set and a bunch of memorabilia cards featuring bat, base, windbreaker and undershirt cards. The annual All Star set was issued as a 68 card box set with the possibility of pulling autograph cards of Tuffy Rhodes or Makoto Imaoka. Once again, BBM increased the number of teams that it issued pack based team sets for. 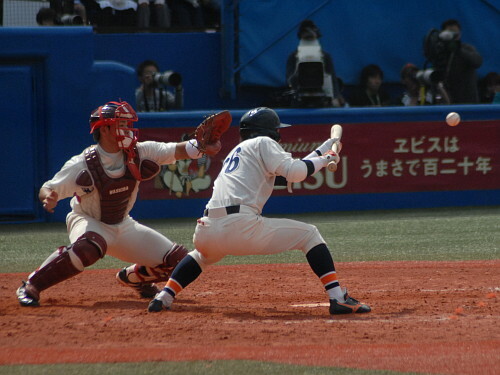 Sets were issued for 8 teams: the Tigers, Lions, Giants, Hawks, Fighters, BayStars, Buffaloes, and Marines. All the sets were between 99 and 126 cards and also included various insert sets and autographed/memorabilia cards. 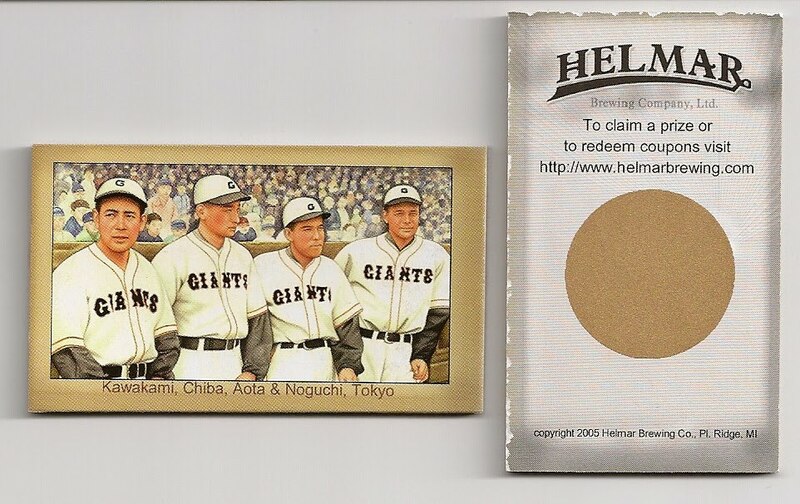 BBM also issued a set for the Giants that was a giveaway at a September Giants game. It featured 20 cards using the same design as the 2nd Version set, but with different pictures. Boxed sets were again issued for both the pennant winning teams (the Tigers and Hawks). 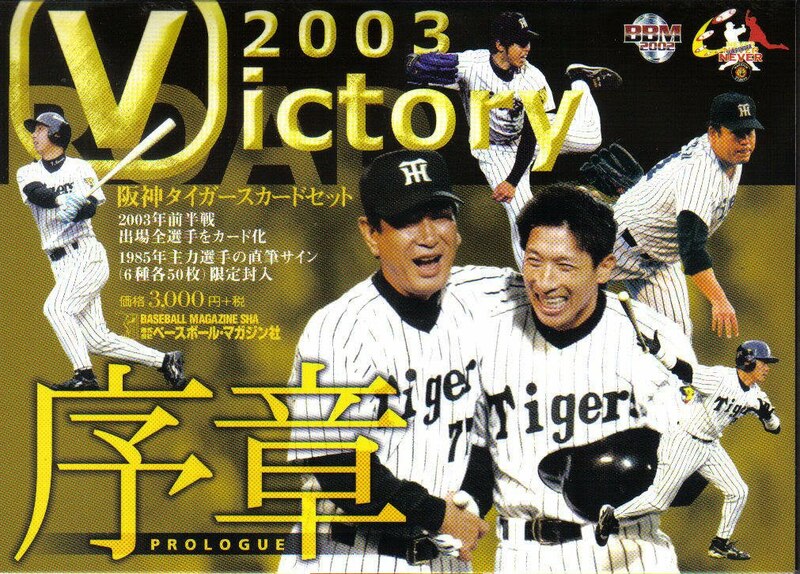 In a bit of twist, though, there were actually two boxed sets issued for the Tigers - the "Victory Road Prologue" set followed a month or so later by the "Victory Road Championship" set. All the sets featured possible autograph cards and the Tigers "Championship" set and the Hawks sets featured possible bat or jersey cards. 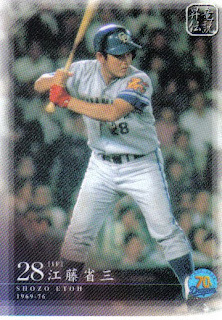 The annual Nippon Series set was a 60 card box set that had possible parallel issues of the Toshiya Sugiuchi Series MVP card. For the second time, BBM issued a set for the Japanese National Team - in this case it was the team that played in the 2003 Asian Games, which was a qualifier for the 2004 Olympics. The 36 card boxed set featured possible jersey cards for Daisuke Matsuzaka, Shigeo Nagashima, Koji Uehara and Tsuyoshi Wada. 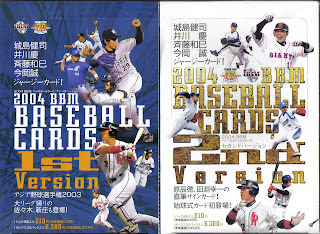 The final 2003 BBM issue was a 30 card box set featuring six cards each of 5 "Young Hawks" - Tsuyoshi Wada, Hayato Terahara, Nagisa Arakaki, Toshiya Sugiuchi, and Munenori Kawasaki. Each box set featured either a jersey, autographed or "special" card for one of the players. 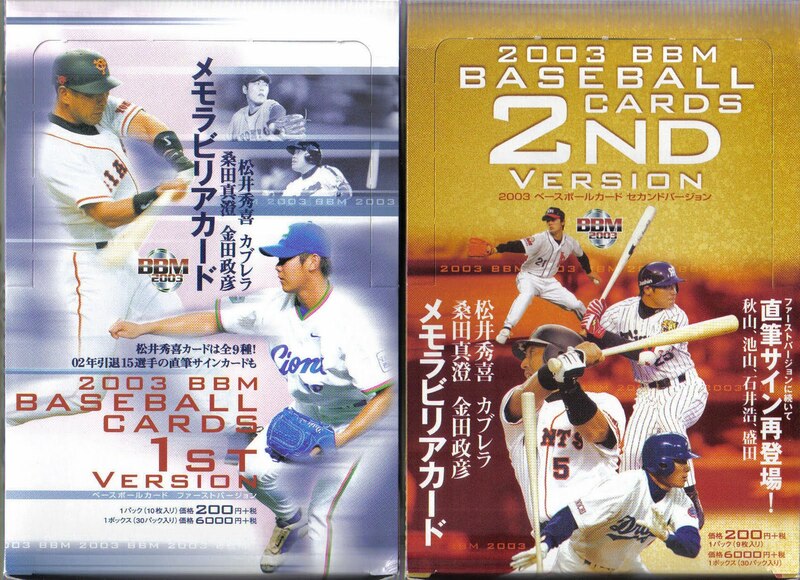 From top to bottom, that's the 1st and 2nd Version boxes, a Rookie Edition wrapper, the box for the Tigers "Victory Road Prologue" set and the box for the National Team set. Got this year's edition of BBM's annual All Star set in the mail today. 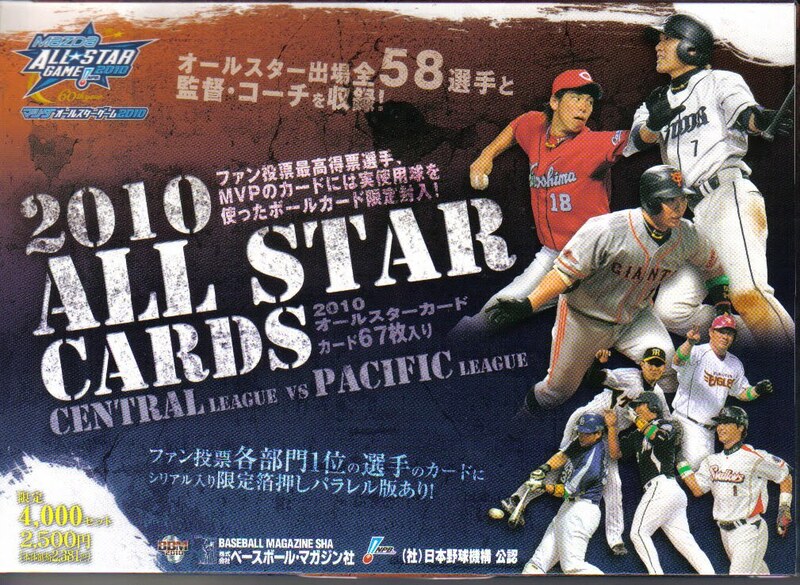 It's a 67 card box set featuring 58 cards of the players on the All Star teams (29 for each league), six cards for the managers and coaches, 2 cards featuring the MVPs of the two 2010 All Star games (Shinnosuke Abe and Yasuyuki Katoaka) and one card for the number 1 vote getter (Kenta Maeda). There are also gold embossed parallel issues of the "Fan Selected" players available - numbered to 150. I don't know if every box has either a ball card or a gold parallel card. 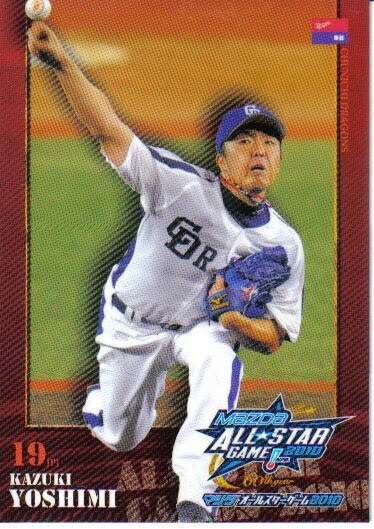 I do know that I got the parallel card for Norichika Aoki. As I said last year - I used to really like the All Star sets, but I've been less and less enamored of them as time goes by. This is the 20th edition of the set - it might be a good round number for me to stop buying them at. I do want to point out that I bought the set through AmiAmi. It took about a week for me to get the set after paying for it. It was on the steep side cost-wise: the set itself was only 1995 yen, but EMS shipping was 1500 yen. The total was about $42. 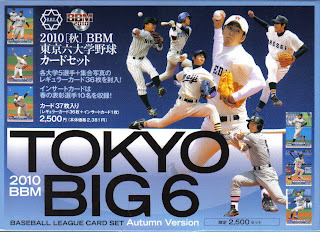 (I'm ordering the 2010 BBM Tokyo Big 6 Fall Version set from them also and I'll be paying about the same again - next time I don't preorder so I don't have to pay shipping twice!). I know Bill Ellis had reported some problems trying to order through AmiAmi - I didn't have any issues. I will say that sometimes their website isn't very responsive, but that wasn't the problem Bill said he had. All I can suggest is that they fixed whatever was wrong when he tried to order.